Click here to buy now and start creating your successful scholarship application with advice from the leading independent expert! How can I apply for the MEXT Scholarship to study in Japan? Am I eligible for the MEXT Scholarship for research students (graduate students)? How can I make my application for the MEXT Scholarship stronger? This guide answers all of those questions and more with clear explanations and bonus worksheets to help you follow along. 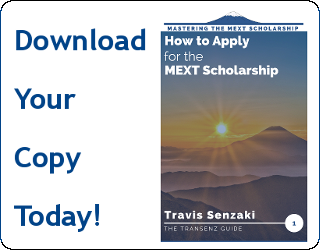 Get the Most Trusted Independent MEXT Scholarship Application Guide! The MEXT scholarship is one of the world’s most generous scholarship schemes for graduate students. It is competitive, but if you know what the reviewers are looking for and how to approach the application, there is no reason why you cannot earn it for yourself! How to Apply for the MEXT Scholarship introduces the scholarship benefits and requirements as well as its goals, then walks you through the process of creating an unstoppable application strategy. What’s waiting for you: Free tuition. Living stipend of over 1.5 million yen per year. Round-trip flight to Japan. 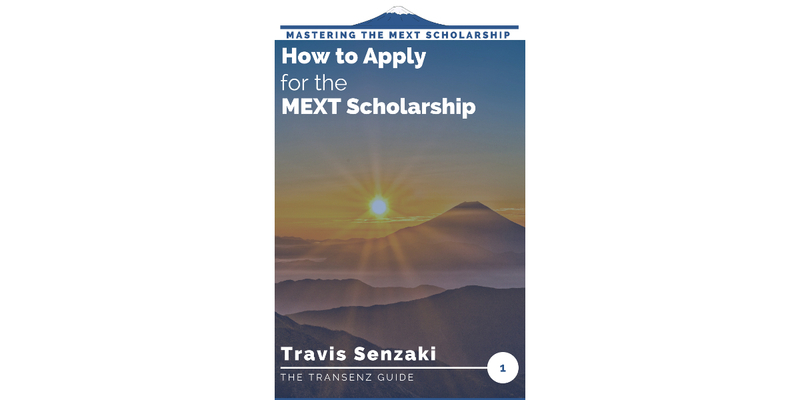 Travis Senzaki is an expert in the MEXT scholarship application process and has worked with over 1000 scholarship applicants over 7 years. He worked as the MEXT scholarship application coordinator at a large, private university for three years and has run the TranSenz blog ever since, where he has published over two dozen articles about the scholarship and answered thousands of applicant questions. How to Apply for the MEXT Scholarship is based on those articles and questions, putting everything together in an easy-to-follow, step-by-step presentation. It is designed so that no matter how much experience you have with the MEXT Scholarship – whether you just heard about it today, or whether you have applied multiple times in the past – you will be able pick up at the right part of the application for you and follow through to created a strong, successful application. If you want anything worth having in life, you have to invest time or money (or both). How to Apply for the MEXT Scholarship is for applicants who don’t mind investing a little bit of money to save themselves a lot of time. At less than 1,000 yen, the book costs less than 0.7% of one month’s scholarship stipend. Consider that winning the scholarship could be worth nearly 10,000,000 yen in stipends – not counting the free tuition and airfare. That’s a potential 10,000X return on your investment! Pick up your copy, now, from TranSenz, directly or from your favorite online book store! The book also comes with worksheets, exercises, and resources to walk you through determining your eligibility and creating your application strategy. This is a long application process – over a year in most cases – and you want to give yourself months to prepare in advance. Download and start reading today! Want to Read it for Free? If you want to check out the book, but don’t have the resources to buy it now, why not try to get it at your university library? No problem. In the meantime, why don’t you take advantage of the free resources I have to offer? If you sign up for my mailing list below, I’ll send you a sample completed application form, plus an email course introducing the MEXT scholarship and the most important things to consider as you start your application. No strings attached! I have a question concerning the requirements of Mext scholarship. Is it true that we need at least N2 in order to be accepted ? Also are there any universities in Japan that teach in English? Yes! I recommend that you check out my article about How to Find Universities and Professors in Japan, which goes into detail on how to search for programs taught in English. However, those are only MEXT’s requirements. The universities you apply to may want to see higher scores. Need infos for me from INDIA. I’m pursuing M.Sc in Zoology and have a plan for PhD in Japan by help of MEXT Scholarship,allow me to know the details of application processes. All of the articles on this site discuss some part of the application process, but if you are just getting started learning about the scholarship, I recommend starting with my recent article introducing the overview of the scholarship. Once you have those basics down, you will be in a better position to choose the articles and guides that will best help you moving forward. This entire site is dedicated to helping applicants for the Japanese government MEXT Scholarship, so I hope you’ll be able to find the resources you need here! Hi, respect the high personality i am applying for technology Mext scholarship. what can i do for apply it ? Unless you plan to read the book, I would recommend that you start with my article on the basic information about the scholarship for more on how to get started. can i apply..i m undergraduated still upto 3 years..
I’m afraid that that’s really not enough information for me to be able to answer your question. The book goes into the eligibility criteria in detail, but if you want a free resource, I have an article about the eligibility criteria for the graduate MEXT scholarship that should help answer your questions! That article is based on the most recent criteria for the University Recommended MEXT Scholarship application that ended recently. I will have another article when the Embassy Recommended MEXT Scholarship Guidelines come out next month! My graduation degree is complete round about July 2019 so i can apply for test in July which is held? Yes! The scholarship application round starting in April this year will be for the scholarship starting in April or September/October of 2020, and you will have graduated by then, so you are eligible to apply. Hi Traviz, I am Reza from Indonesia. I need more detailed info about what are documents needed and where to submit the MEXT scholarship using University Recommendation? Fyi, I’ve got a recommendation letter from my former supervisor during completing Master degree course, and a Letter of Acceptance from Professor in designated university in Japan. However, due to he just joined with the university (he is not a Japanese), so he asked me to find the detail about the MEXT information. Thanks in advance for your help. The application process for the University Recommended MEXT Scholarship is over for this year (Fall 2019 start). Your next opportunity to apply is going to be the Embassy Recommended MEXT Scholarship application process that starts in April of this year for the scholarship starting in Spring or Fall 2020. The next University Recommended MEXT Scholarship application process should start some time between next September – December (it depends on the university). I want to ask about the date line of 2018/2019 intake i really want to start in september 2019. Am 19 years old. Am undergraduate. The application period takes more than a year, so the deadline for the 2019 intake was in May or June of 2018 (it depends on the country). The next application period should start around April 2019 for the scholarship beginning in 2020. I recommend that you check the Japanese Embassy’s website in Malawi each day beginning in April to look for the application guidelines there. As I mentioned in a reply to another of your comments, this website is dedicated to the scholarship for research (graduate) students, so I do not have any particular resources for undergraduate scholarship applicants. Unfortunately, my area of expertise is on the scholarship for research (graduate) scholars, and I do not have any resources specifically for undergraduate applicants. I hope some of the articles here, such as the articles about strategy and filling in the application form, will still be of some help to you. Ye again. Sorry to bother you with another question. In the email you sent you asked a question about future plans after graduation and in my answer I included a question but I’m thinking that it might be better to ask it here. My original plan was to graduate and find work in a design firm or publishing house in Tokyo so that I would be able to extend my studies into work. But since the MEXT scholarship has certain expectations for the applicant to return home after completing graduate studies I am wondering if it is at all possible to find work here after graduating from the mext program, and whether it’s something I should mention in the application and interview. Yes, it’s better to ask questions here. I answer these posts at a higher priority and sometimes can’t get to emails for weeks, so I have stopped answering emailed questions directly (I answer them in FAQs). MEXT expects that after you finish your degree, you will work in a capacity that will help better connect MEXT to your home country. In most cases, that means returning to your home country and using your education and experience to advance in your career and become an advocate for closer relations to Japan in your field – or in your case, creating art and designs that help promote Japanese culture. However, if you have a reason why you can serve better as a bridge between cultures by working in Japan, that is absolutely allowed, as far as MEXT is concerned! (Some individual countries do require their scholarship winners to return home, but that is on a country-by-country basis, for the Embassy Recommendation MEXT Scholarship, only). Regardless of what plan you state in your application form – whether you say that you want to return home or want to stay in Japan, or even if you want to go straight into the workforce or advance to another degree – you are not bound by that as a formal agreement. Nothing would stop you from searching for a job or applying for an advanced degree at the end of your scholarship. Thank you for clearing that up! Greatly appreciated. I have a question about the GPA calculation. I used the GPA calculator from your book, and my average is fine, but I did take one class again because I didn’t pass the first time. On the official transcript it is marked that I took the class twice and the score of my second class, but it did not specify what grade I had the first time I took the class. I was just wondering how this would be inputted into the MEXT system. When I put it into the excel chart I just marked zero for the first time and the second grade, as well as the credits, so that it counts as two classes instead of one. Is it right? And would this affect my application? I think that the calculation approach you used is the safest. If you count the first instance of the class as having failed (0 GPA) and include the full amount of credits, that is the worst possible way it could be considered. In the end, it might not be counted at all, but as long as you know that you meet all the requirements even in the worst case scenario, you are fine! (Of course, it only matters at all if both instances of taking the class were in the last 2 years). As far as affecting your application, the biggest effect would be lowering your GPA. Aside from that, it could cause concern for the reviewers if it was a key class for your major and related to what you would be studying in Japan, but that would be entirely subjective, so it is hard to give any certain answer. I printed out my transcripts from my school last year in March, 2018, before I left to study Japanese in Tokyo. Is it alright to use these to apply? Or do I have to get newer transcripts? I hear that some school applications require the date of the transcript to be recent. Thank you very much! And sorry to bother you with all these questions! As long as the transcripts are official, they should be acceptable, but I would recommend checking with your university to see if they have any specific requirements. MEXT, at least, does not have a specific rule for how recent the transcripts must be printed – as long as they show your most recent grades. It’s not a bother at all! If it wasn’t for the questions, I wouldn’t know what is really bothering you and other applicants about the process, so I would not know what to research and make clearer in future articles. Thank you! I have an article about how to find universities in Japan that teach your field of study in English. That would be a good place to start looking for a good program. The rest of the guides on this site are dedicated to helping you get the information you need about the MEXT Scholarship, so I hope you are able to find the advice you need there! hi, I m from bangladesh. I have completed my MPH in dental public health.Is their any related subject in which I can earn a PHD degree with scholarship? I have an article about how to find universities that teach your field of study in English as well as identify professors that should help answer your question. YOu can find that article here. That’s exactly what this book, as well as all of the articles on this site are designed to do. I hope you can find the resources there that you need! I recommend starting with the Basics of the Scholarship as well as my article on how to find universities that teach your degree in English. I have an article all about how to find programs and professors in your field in Japan that should answer your questions! I just passed +2 (inter) from Science .And I want to study B.Sc in Japan. That’s why I am searching a best university with cheap fee. And I want scholarship also. My expertise and all of my articles are about the scholarship for graduate students (M.Sc. and higher). I do not have any specific information on the undergraduate scholarship, though some of the guidelines and strategies in my articles may be helpful to you. I would suggest you start with my article about how to find universities in Japan that teach your field of study in English. Regarding the slight change in field of study, it may be possible, but it is up to you to explain to the reviewers how the two fields are related in your Field of Study and Research Program Plan. Thanks so much for the information and updates you continue to provide regarding the MEXT Scholarship application process. I just started reading about the MEXT scholarship and it enormous benefits to scholars. However, it is already December in my country and want to take advantage of the scholarship, so, which one can I take advantage of now taking into consideration the time? I would recommend that you start preparing now to apply for the Embassy-Recommended MEXT Scholarship when it opens up next April. I always recommend that you take several months to prepare, anyway, as it takes time to craft a high quality Field of Study and Research Program Plan and to research the universities and professors where you want to study. Start preparing now and by the time the application guidelines are released on the Japanese Embassy’s website in the spring, you should have a strong application and be ready to succeed! You would get all of the application forms from the university or embassy where you plan to apply. I recommend my article on getting started with the MEXT scholarship for more information on how to decide where to apply and get moving with the process. You can apply for the MEXT Scholarship by University Recommendation or Embassy Recommendation. While I cover the specific pros, cons, and timelines for each application process on the book, you can also get a general introduction to them in my article about getting started with the MEXT scholarship. You can also find a number of other strategy articles on this site, including how to improve your chances, how to get the most out of your Field of Study and Research Program Plan, etc., so as you move along with the application process, I hope you will be able to find useful advice for each stage in the free articles. I need this scholarship,please help me. That is what my book and website are designed for! I hope in reading the book and/or browsing the free articles on this site, you are able to find the information you need about the application process. If you have specific questions about the contents of the various articles, please leave them in the comments on those articles and I will get back to you as soon as possible. If you don’t want to start with the advice in the book, then I would recommend you start by reading some of the articles on the site. For example, my article on getting started with the MEXT scholarship will explain the different application processes and how to get the forms for each one! Unfortunately, I do not know any specific instructions or guidelines about the undergraduate scholarship. But I do know that you can apply before you have completed high school, so it should be fine to apply even without your school leaving results exams. All of the application guidelines should be available on the Japanese Embassy’s site in April. I am a student of class XI, I shall appear class XII board exam on 2020. I want to apply for MEXT on 2020. My date of Birth is 20th October 2002. Please tell me if I am eligible for under graduate categories. If yes, please guide me that when should I fill up form . I’m afraid I do not understand what you mean by classes. If you want to apply for the MEXT scholarship beginning in 2020, then the application process will start at the Japanese Embassy or Consulate in your home country around April of 2019. Some time in early to mid April, they should post the application guidelines that will include all of the eligibility criteria and application instructions, so I recommend that you start checking that site on a daily basis once April begins. I have passed 1. screening and applied for 2. screening. I am waiting for results however, I do not know I will hear from embassy again. When they usually confirm I passed 2. screening and which university I am going to study? It really depends on the country. Some might confirm that you have passed the secondary screening as early as this month, but others may wait until your placement is also decided and inform you of both at once. In that case, you might not hear back until December or January. My recommendation would be to check the application guidelines again on the embassy’s website where you applied and see if they provide any information about when they will release results. I can understand and speak a little bit of Japanese but still yet to be able to write and read will it be better if I start learning from now? Is there any other schorlarship I can apply ? With less statistical issues or long process ? It sounds like your best choice might be applying for the Embassy Recommended MEXT Scholarship for studies starting in 2020. That application process should begin in April of 2019 and this would be a great time to start preparing, little-by-little! Unfortunately, the only resource I have right now that has a step-by-step approach is my book, which includes application timelines, but I will be working on getting a better framework out soon in an article form, as well. Those articles should address a lot of your questions, but if there is anything remaining, feel free to leave another comment and I will get back to you as soon as possible! Please I did like to know the number of copies of application documents. You won’t be able to find out for sure until the official applications guidelines come out next April or so when the application process begins, but it should be 1 original and 2 copies of each document (at least, it has been that way for several years so far). I am not directly involved in the scholarship award process, I am a blogger and coach. If you follow as much of the advice on this site as possible, you should put yourself in a good position to win the scholarship. But keep in mind that the MEXT scholarship is a merit-based scholarship, not a need-based scholarship. So, when you apply, do not emphasize how much you need it, emphasize the good that you will do for others after you earn it. It is impossible to say for sure, but I see no reason to believe that it would not be! That’s exactly what this site is designed to do. I hope you can find the resources you need here! The next application process will be the University Recommended MEXT Scholarship Application for 2019. It may be ongoing now or starting soon, depending on the university. Hello. What is the deadline for MEXT application and where should I upload the application form? Then next opportunity to apply for the MEXT Scholarship would be the University Recommended MEXT Scholarship for Fall 2019. The application deadline and where to send the application depends on the university where you intend to apply. I wrote an article about how to find that information that should help you get started here. In almost all cases, you will have to mail your application. You would not simply be able to upload the documents. That’s what this site is here for! You should be able to find information about whatever part of the application process you are struggling with. If not, let me know, and I will add your questions to the list of things to address in future articles. Of course, if you’re looking for a start-to-finish guide, then I have a book written for that purpose, as well. So I’ve been looking around and I saw that the University of Tokyo has a computer science undergrad program, however, this doesn’t seem to show up under the fields you can choose from in the MEXT undergrad program. Is Computer Science not a choice or am I missing something? What list is this that you’re referring to? I’m afraid I’m not an expert in the undergraduate scholarship, but I have never seen a list from MEXT saying which fields you are and are not allowed to apply for. If you can point me in the direction, I’ll look into it! and how to apply for it. And again is Asia Pacific University among the Embassy Recommendation list? You start the application about a year before when you want to start your studies, so the deadline for Embassy application process to start studies in 2019 is already past. Typically the application process starts officially in April with a submission deadline in May, but you want to start preparing several months before that. Ultimately, you will get the application instructions from the Japanese embassy in your country, but in the meantime, you can find my post from this year’s cycle about how to apply for the Embassy Recommendation here. Hello. First of all i thank u for your guidance. I just read about MEXT from your website. Now i am studying in language school in Japan and looking for PhD degree program in english. Just came here in early of Jul.2018. So i have to re-enter in japan for get this scholarship program? if so is there any other way? In general, yes, you would have to return to your home country during the application process and obtain a new visa to come to Japan for the scholarship. The only exception I know of is if you apply for the University Recommendation MEXT scholarship and are selected for one of the Top Global University scholarship slots. My understanding is that scholarship winners in that category do not need to leave Japan before starting the scholarship, but I also do not know of any way to specifically apply for those slots. Typically, they are awarded through other procedures determined by the university. Thanks for your wonderful guide. Will be looking forward to purchasing one of your books. Please will applicants for mext 2019 embassy recommendation be informed about the written exam or only successful applicant? For the embassy recommendation process, each embassy has it’s own timeline and deadlines, so I’m afraid I can’t answer that without knowing where you are from. I would recommend checking the application guidelines on their website to see if the date is mentioned there. Are the applications closed already?? Yes, applications closed for South Africa on June 8th. You’ll either have to wait for the University Recommendation MEXT scholarship application this fall or for next year’s embassy recommendation. But that should give you more time to prepare and strengthen your application! Please how do I write/construct a good research topic and plan. The deadline in my country is next week and I just got to know about the scholarship. A quick reply would help. Thank you. Unfortunately, there’s no quick way to write a quality Field of Study and Research Program Plan. I have written an article about how to format the document once you have your plan and I am working on a book that will walk you through the process of deciding on a research topic, validating it, and writing your plan, but that is not ready yet. (Since it’s a book-length topic, I’m afraid there isn’t much I can say in the space of this short comment that would be helpful). I am applying for the 2019 Embassy Recommendation MEXT Scholarship in Kabul-Afghanistan. Please I’d like to know is there any contact number or how to make an appointment to submit my documents to the Embassy in Kabul? Please help me with an answer. You should search for the website of the Japanese Embassy in Afghanistan to find their contact information. I am applying for the 2019 Embassy Recommendation MEXT Scholarship. Please I’d like to know the number of copies of “application documents” we’re expected to submit to the Embassy for the application. This is because section 9 of the “Application Guidelines for Research Students” lists 11 application documents to be submitted to the embassy. The ‘third and fourth columns’ of the table show ‘1 original and 2 copies’ of the documents to be submitted. I am still confused on whether I am expected to submit 1 original and attach 2 photocopies the the original document, as applicable. It sounds like you have it figured out. You need to submit one original of each document and also make 2 photocopies of each one, as well. Do not “attach” them to one another, though. Just file them together in order. Thank you very much Travis. Though I already sent my application to the Embassy before you replied, but I did exactly as you have suggested. (1). I couldn’t submit photocopies of the recommendation letters from both my Adviser and Employer as they were sealed in an envelop. I just simply numbered the envelops, accordingly, at the top right corner and submitted. I hope this doesn’t affect my application. (2). I couldn’t submit original copy of my graduation evidence (Statement of Result) because I can’t afford to lose the only one I have. However, I submitted only two photocopies. The case was also similar regarding my ‘transcript of academic records’. (3). Since the university I attended is yet to give me my graduation certificate, I hope MEXT would accept my ‘Statement of Result’ as an evidence of my graduation? 1) I would have recommended that you contact the embassy in advance to get their advice about the letter of recommendation and what to do. If they told you to submit just one original in the sealed envelope, then that’s fine. 2) A copy certified by the university can often be accepted as an “original”, so I would have recommended that you submit a certified copy (after checking with the embassy to make sure that would be acceptable to them). 2) A certificate of graduation is any official document from your university saying that you have completed the requirements for the degree and have graduated. It does not have to be the formal diploma. So it sounds like the letter that you mentioned should work. Once again, thank you so much. Your answers have given me much relief: copies are certified; contacted the Embassy, and they said I’m good! AOA to All my Group members. How are You? Hope so all of you are fine. Anyone who has applied for Mext Scholarship 2019 (Japan) embassy Recommended for Mphill (Research-based)? A little bit guide is needed. You might have a little more success if you ask a specific question. Other than that, this site is filled with guides on the MEXT scholarship, so I hope you can find the information you need.